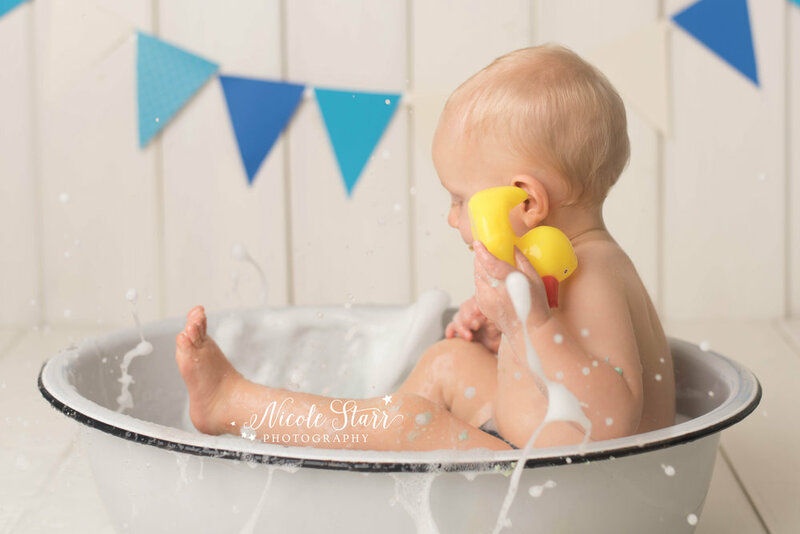 For Ryan's birthday session, we tried something a little different for his cake smash... by following it up with a SPLASH! 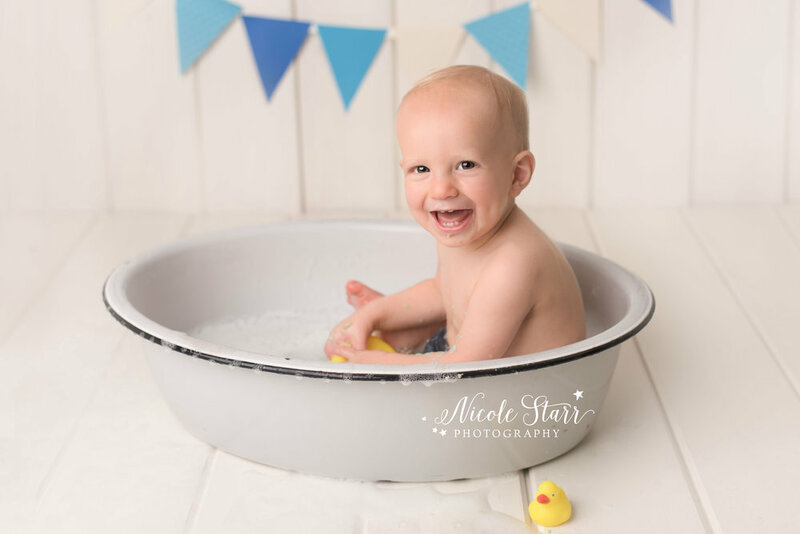 This little boy absolutely loves the water, so it was only natural to have a smash & splash, with a bubble bath after his session to capture a few more adorable photos of him as he celebrates his first birthday. 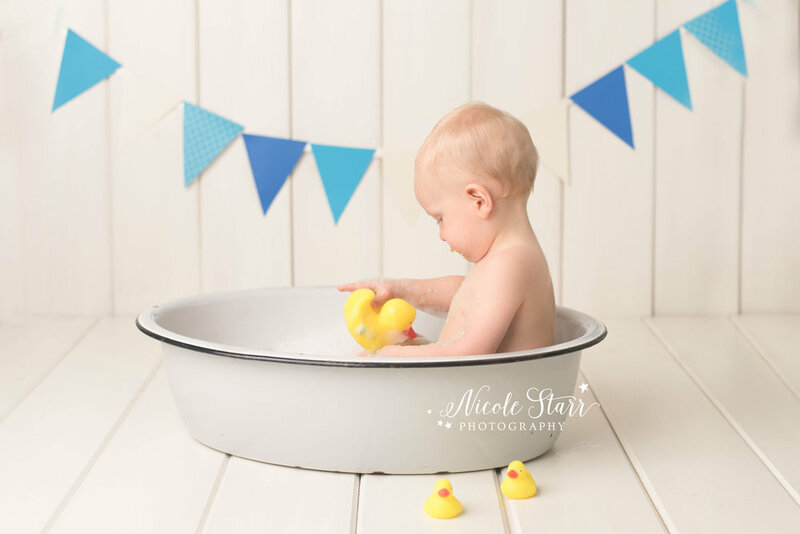 I was thrilled to finally be able to use this vintage washing tub that I found at the Brimfield Flea Market last year, and to use our brand new wooden boards backdrop for the very first time in our new studio! Ryan's family came to our Saratoga Springs studio to celebrate 365 days of parenthood. 365 days of smiles, 365 days of cuddles, and 365 days of an amazing little boy who has brought so much light to their world. Seriously, this little boy is ALWAYS HAPPY. He smiled the entire time we were together, and he never got fussy for even a moment. That is a rarity when photographing little ones (check out some upcoming blog posts — we are going to show you ALL of the crying babies! ), and I was thoroughly impressed. I could photograph happy babies all day, every day! Ryan LOVED his cake. His mom told me before our session that he loves to eat, and she wasn’t kidding. He ate more of his birthday cake than any other baby I’ve ever photographed. 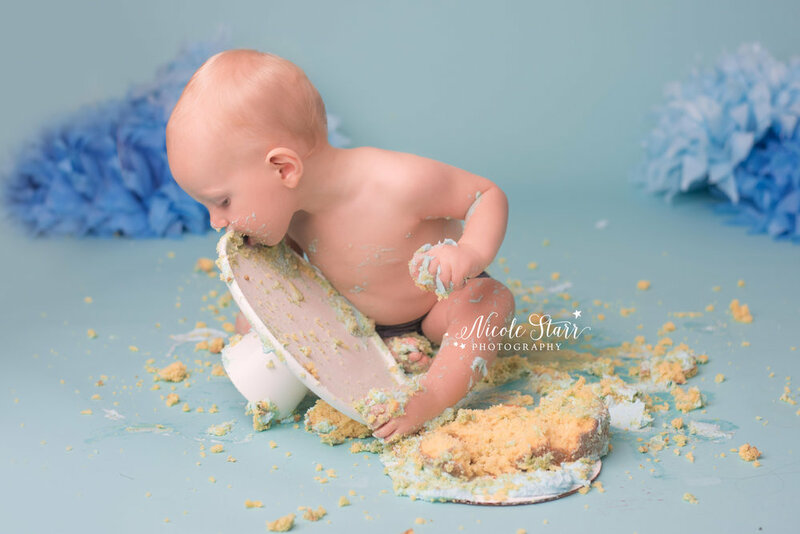 Ryan set a record in our studio for being the very first baby to devour his entire cake. And then, he was looking for more cake by leaning in to lick every crumb off of the cake stand. 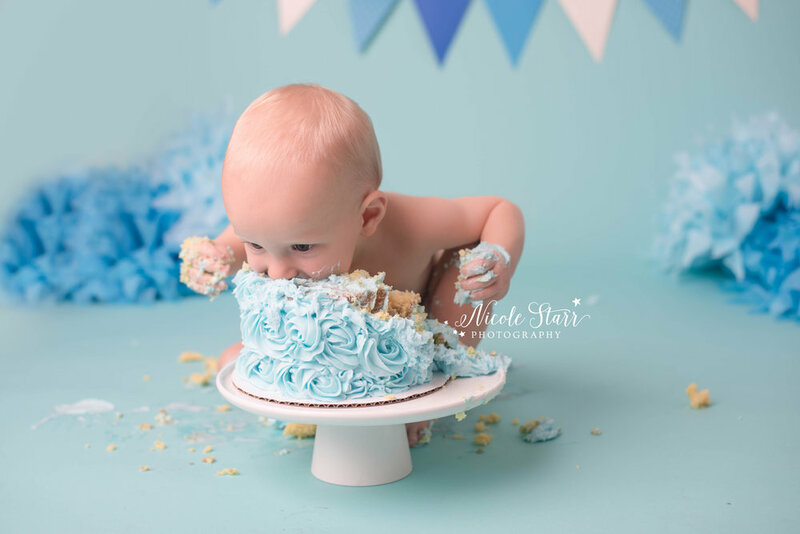 What little bit wasn’t stuck between his toes and fingers was inside of his belly, and at the end of his session there was no solid cake left on our seamless paper! We couldn’t stop laughing at his eagerness to devour his sweet little birthday cake, and we were so glad to capture that excitement on camera during his cake smash. Is your baby turning one in the next few months? Email us at hello@nicolestarrphotography.com and let’s chat about planning the perfect birthday celebration for this milestone! Use the contact tab above to get in touch, and you can also browse more cake smash inspiration in the “Sessions” tab above!